Place cucumbers in a colander and sprinkle with salt. Set aside until water is drawn out of cucumbers, about 30 minutes. Pat cucumbers dry to remove excess salt. 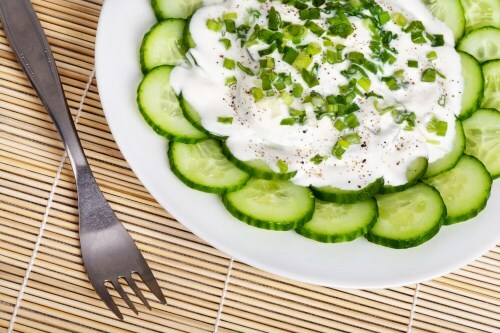 Mix cucumbers, onion, pistachios, lemon juice, lemon zest, garlic, black pepper, and cayenne pepper in a bowl; stir in yogurt. Garnish a serving bowl with lettuce leaves; pour cucumber mixture into middle of the bowl. Surround cucumber mixture with tomatoes. Refrigerate for flavors to blend, at least 30 minutes.